A conservative pro-immigration reform group has issued talking points to Republican lawmakers, telling them to avoid referring to the U.S. citizen children of illegal immigrants as "anchor babies" or calling for the construction of an "electric fence" on the border, among other things. The talking points, published by BuzzFeed, went out to Republican lawmakers on the Hill as momentum builds for an immigration bill that would legalize most of the country's 11 million illegal immigrants. The memo urges lawmakers to call them "undocumented immigrants" and to avoid terms such as "aliens" or "illegals," which are seen as offensive and dehumanizing. Another phrase to avoid? "Send them all back." 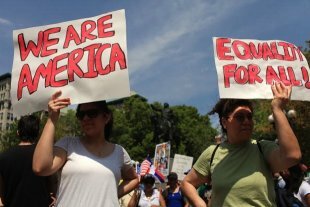 "Conservatives get a bad rap when it comes to immigration reform because of a few people who say things that can be taken to be offensive," said Jennifer Korn, executive director of the Hispanic Leadership Network, the center-right group that sent the talking points on Monday. "It all means the same thing, but the way you say it matters." Korn worked in the White House when President George W. Bush attempted to get immigration reform passed in his second term. Two bills?one in 2006, the other in 2007?died after a vocal grass-roots movement emerged in opposition to what it called "amnesty" for illegal immigrants. The amnesty tag stuck, even though both bills would have required any applicant to go through a lengthy legalization process that required him or her to meet certain requirements, like paying back taxes and a fine and learning English. Lawmakers received thousands of phone calls about the bill, Korn remembers, almost all of them strongly against reform. Korn hopes theses talking points will help avoid the "pitfalls" she saw then. "Right now what's really giving me heartburn is people saying 'pathway to citizenship,'" she said. "It's not a pathway to citizenship. It's 'earned legal status.' If you want conservative support you have to explain what it is so there's not this knee-jerk reaction of 'No amnesty!'" Sen. Marco Rubio, a Republican from Florida who's part of a bipartisan group of senators pushing for immigration reform, has used "earned residency" at times in interviews with conservative talk show hosts to describe what immigration reform would provide to qualifying illegal immigrants. Democrats, including Obama, often use "pathway to citizenship" to describe the bill.